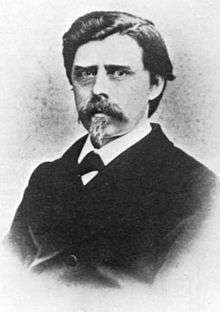 David Edward Hughes (16 May 1831 – 22 January 1900), was a British-American inventor, practical experimenter, and professor of music known for his work on the printing telegraph and the microphone. He is generally considered to have been born in London but his family moved around that time so he may have been born in Corwen, Wales. His family moved to the U.S. while he was a child and he became a professor of music in Kentucky. In 1855 he patented a printing telegraph. He moved back to London in 1857 and further pursued experimentation and invention, coming up with an improved carbon microphone in 1878. In 1879 he identified what seemed to be a new phenomenon during his experiments: sparking in one device could be heard in a separate portable microphone apparatus he had set up. It was most probably radio transmissions but this was nine years before electromagnetic radiation was a proven concept and Hughes was convinced by others that his discovery was simply electromagnetic induction. Hughes was born in 1831, the son of a musically talented family hailing originally from Y Bala (the place of birth was either London or Corwen, Denbighshire), and emigrated to the United States at the age of seven. At only six years old, he is known to have played the harp and english concertina to a very high standard. At an early age, Hughes developed such musical ability that he is reported to have attracted attention of Herr Hast, an eminent German pianist in America, who procured for him a professorship of music at St. Joseph's College in Bardstown, Kentucky. Hughes also worked as a practical experimenter, coming up with the printing telegraph in 1855. He moved back to London in 1857 to sell his invention, and worked on the transmission of sound over wires. He worked on microphones and on the invention of the induction balance (later used in metal detectors). Despite Hughes' facility as an experimenter, he had little mathematical training. He was a friend of William Henry Preece. 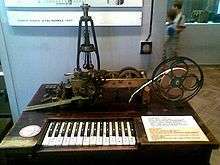 In 1855, Hughes designed a printing telegraph system. In less than two years a number of small telegraph companies, including Western Union in early stages of development, united to form one large corporation — Western Union Telegraph Company — to carry on the business of telegraphy on the Hughes system. In Europe, the Hughes Telegraph System became an international standard. In 1878 Hughes published his work on the effects of sound on the powered electronic sound pickups, called "transmitters", being developed for telephones. He showed that the change in resistance in carbon telephone transmitters was a result of the interaction between carbon parts instead of the commonly held theory that it was from the compression of the carbon itself. Based on its ability to pick up extremely weak sounds, Hughes referred to it as a "microphone effect" (using a word coined by Charles Wheatstone in 1827 for a mechanical sound amplifier). He conducted a simple demonstration of this principle of loose contact by laying an iron nail across two other nails connected to a battery and galvanometer. His paper was read before the Royal Society of London by Thomas Henry Huxley on May 8, 1878 and his new "microphone" was covered in the July 1 edition of Telegraph Journal and Electrical Review. Hughes published his work during the time that Thomas Edison was working on a carbon telephone transmitter and Emile Berliner was working on a loose-contact transmitter. Both Hughes and Edison may have based their work on Philipp Reis' telephone work. Hughes would refine his microphone design using a series of "carbon pencils" stuck into blocks of carbon to better pick up sound but never patented his work, thinking it should be publicly available for development by others. Hughes seems to have come across the phenomenon of radio waves nine years before they were proven to exist by Heinrich Hertz in 1888. In 1879 while working in London Hughes discovered that a bad contact in a Bell telephone he was using in his experiments seemed to be sparking when he worked on a nearby induction balance. He developed an improved detector to pick up this unknown "extra current" based on his new microphone design and developed a way to interrupt his induction balance via a clockwork mechanism to produce a series of sparks. By trial and error experiments he eventually found he could pick up these "aerial waves" as he carried his telephone device down the street out to a range of 500 yards (460 m). On February 20, 1880 he demonstrated his technology to representatives of the Royal Society including Thomas Henry Huxley, Sir George Gabriel Stokes, and William Spottiswoode, then president of the Society. Stokes was convinced the phenomenon Hughes was demonstrating was merely electromagnetic induction, not a type of transmission through the air. Hughes was not a physicist and seems to have accepted Stokes observations and did not pursue the experiments any further. A connection with Hughes phenomenon and radio waves seems to show up 4 years after Heinrich Hertz's 1888 proof of their existence when Sir William Crookes mentioned in his 1892 Fortnightly Review article on Some Possibilities of Electricity that he had already participated in "wireless telegraphy" by an "identical means" to Hertz, a statement showing Crookes was probably another attendee at Hughes' demonstration. Hughes did not publish his findings but did finally mention them in an 1899 letter to The Electrician magazine where he commented that Hertz's experiments were "far more conclusive than mine", and that Marconi's "efforts at demonstration merit the success he has received...[and] the world will be right in placing his name on the highest pinnacle, in relation to aerial electric telegraphy". In the same publication Elihu Thomson put forward a claim that Hughes was really the first to transmit radio. Hughes' discovery that his devices, based on a loose contact between a carbon rod and two carbon blocks as well as the metallic granules in a microphone that exhibited unusual properties in the presence sparks generated in a nearby apparatus, may have anticipated later devices known as coherers. The carbon rod and two carbon blocks, which he would refer to as a "coherer" in 1899 is also similar to devices known as crystal radio detectors. 1948 Watson-Watt, RobertRobert Watson-Watt "for his distinguished contributions to atmospheric physics and to the development of radar"
Hughes died in London and was buried in the Egyptian vaults at Highgate Cemetery. A Grand Gold Medal awarded at the Paris Exhibition, in 1867. Royal Society gold Medal in 1885. Society of Arts Albert Gold Medal in 1897. Chevalier of the Legion of Honour, presented by Napoleon III for his inventions and discoveries in 1860, granting him the title "Commander of the Imperial Order of the Legion of Honour". 1 2 "David Hughes". Encyclopædia Britannica Online. 1 2 3 Anon. "88. David Edward Hughes". 100 Welsh Heroes. Culturenet Cymru. Retrieved 30 June 2009. 1 2 3 "David Hughes". Encyclopaedia Britannica online. Encyclopedia Britannica Inc. 2014. Retrieved April 11, 2015. ↑ Worrall, Dan W. "David Edward Hughes: Concertinist and Inventor" (PDF). Concertina Press. Retrieved 6 April 2015. 1 2 3 4 5 6 Sarkar, T. K.; Mailloux, Robert; Oliner, Arthur A. (2006). History of Wireless. USA: John Wiley and Sons. pp. 260–261. ISBN 0471783013. ↑ Anon. "88. David Edward Hughes". 100 Welsh Heroes. Culturenet Cymru. Retrieved June 30, 2009. ↑ Proceedings of the Royal Society of London, Volume 30, 1899, pages 373, 468–469. ↑ "2 in U.S. hono by Royal Society". The New York Times. 3 November 1939. Retrieved 5 February 2009. ↑ Nature. Nature Publishing Group. p. 109. ↑ "Selling Snow in Syria.". Chicago Tribune. 2 December 1906. Retrieved 5 February 2009. ↑ Mehra, Jagdish (1989). The Historical Development of Quantum Theory. Springer-Verlag. p. 233. ISBN 0-387-96284-0. ↑ Nature. Nature Publishing Group. p. 156. ↑ Bell Telephone Magazine. American Telephone and Telegraph Company Public Relations Dept. 1936. p. 59. ↑ Wasson, Tyler (1987). Nobel Prize Winners. Visual Education Corporation. p. 598. ISBN 0-8242-0756-4. ↑ Who Was Who in Literature. Thomson Gale. 1979. p. 955. ↑ Proceedings of the Royal Society of London. Royal Society Publishing. 1926. p. 15. ↑ Science. HighWire Press. 1926. p. 552. ↑ Wasson, Tyler (1987). Nobel Prize Winners: An H.W. Wilson Biographical Dictionary. Wiley. p. 30. ISBN 0-8242-0756-4. ↑ Science. American Association for the Advancement of Science. 1936. p. 480. ↑ "Oxford DNB article:Oliphant, Sir Marcus Laurence Elwin (subscription needed)". Oxford University Press. 2004. Retrieved 6 February 2009. ↑ "Janus: The Papers of Sir Basil Schonland". Janus. Retrieved 6 February 2009. ↑ "Martin Ryle – Autobiography". nobelprize.org. Retrieved 6 February 2009. ↑ "Brown, Robert Hanbury – Bright Sparcs Biography Entry". University of Melbourne. Retrieved 6 February 2009. ↑ Parker, Sybil P. (1980). McGraw-Hill Modern Scientists and Engineers: A-G. McGraw-Hill Book Company. p. 56. 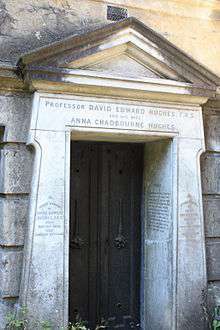 "Hughes, David Edward". Encyclopedia Americana. 1920. Chisholm, Hugh, ed. (1911). "Hughes, David Edward". Encyclopædia Britannica (11th ed.). Cambridge University Press.